Grand Rapids Press: "A sweet, singing tone spins from his Stradivarius, but Hadelich has the emotional restraint to ladle out passion carefully, favoring expressiveness over exuberance. In short, he's well suited to interpret Brahms." National Post: "If we expect concertmasters to play it safe, Crow was in no mood to confirm the stereotype." ConcertoNet: "The reverie of the second movement probably came off best, but the whole performance was a real success." Focus Taiwan: "Violinist Lisa Batiashvili charmed the audience with her sophisticated solo performance in the violin concerto. At the end of the program, the audience stayed and cheered for around five minutes, to which the orchestra responded by offering an encore." Boston Classical Review: "As heard on her recent recording of these works (with Honeck conducting the Berlin Philharmonic) and performance Thursday night, Mutter's playing is rife with free-flowing expression and razor-sharp focus." Boston Globe: "Mutter, too, from her first entrance played with conviction, tonal variety, and at times a muscular brand of virtuosity. She pushed her tone in certain passages presumably to make an interpretive point. I only wish I came away with a clearer sense of what that vision was." The Guardian: "Overall, it felt as if this interpretation had seen better days, even if the spirit of the piece came across - the languid melancholy of the slow movement, for instance, or the open-air ebullience of the finale." Chicago Classical Review: "Frang possesses an assured technique and her playing was faultless, intonation focused and style impeccable. 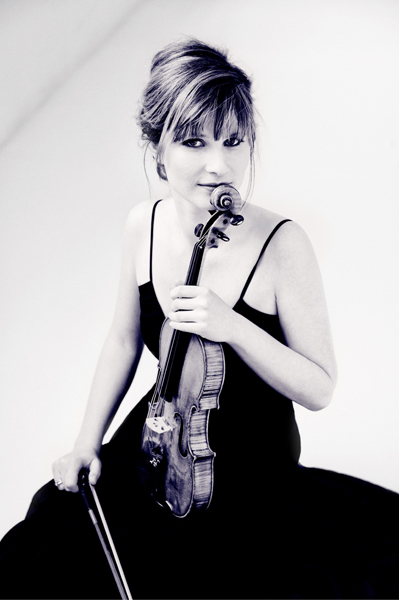 Her 1709 Engleman Stradivarius has a slender sweetness and sinew well suited to Prokofiev's acerbic concerto. But from an interpretive standpoint, her performance was almost unrelievedly bland and boring." Chicago Tribune: "Here Temirkanov's collaborator in the Prokofiev was Norwegian violinist Vilde Frang, who began in rumination and tightened as the score demanded without coarsening her smooth silvery tone." The Guardian: "Tognetti's name sits comfortably alongside the likes of Torelli, Veracini and Vivaldi, whose influence was core to the Dresden aesthetic and, in terms of technique, he is up there in the highest league." The Guardian: "Michael Barenboim, 27-year-old son of Daniel and concertmaster of the groundbreaking West-Eastern Divan Orchestra,. was the soloist on Mozart's Violin Concerto No 4, which combined technical precision and a breezy sweetness to exhilarating effect, with Barenboim playing the hire-wire act with two vertiginous solos." The West Australian: "The most appealing feature of Barenboim's performance was a consistently fine, silvery tone that caressed the ear - and the cadenzas could not be faulted." South Wales Argus: "One rarely hears the Academic Festival Overture performed with such a sense of something worth being rolled out in the interests of revealing its constituent merits. Plodding or rushed it was not. The same with the Violin Concerto, its solo line played with unerring sympathy and a consistently singing tone by Christian Tetzlaff, another who is one of the best around. Neither soloist nor conductor compromised on the music's emotions or its logical structure." Stuff Nation: "Her technique was rock solid throughout all four movements of the concerto and the multitude of technical challenges required in this piece were well and truly met. The emotional journey of the violin and the characters in the story were also told with sympathy and skill. It was a memorable performance and proved to be an excellent choice for this concert." New Zealand Herald: "Soloist Chloe Hanslip's poised entry, almost improvisando, against a wash of strings, soon gave way to fiery tussles with some belligerent orchestral writing." Herald-Tribune: "Chen... dug into the youthful Mozart's music with more emotional flamboyance than what we might expect." Finally, a reminder that our editor, Laurie, is in Austin, Texas this week for the 2014 Menuhin Competition and will be posting reviews and interviews all week! So keep checking Violinist.com, on the website front page, on Twitter and on Facebook, for updates from the competition.